Jacob's Ladder - a lovely plant or a pernicious weed? Please can anybody tell me how to get rid of what we in the UK call 'Jacob's Ladder' What do you call it over the pond? - it is growing amongst ornamental grasses and other lovely plants. Yet seen a variegated variety for sale in garden centres.There again seen them sell variegated ground elder ! Should be a criminal offence. How do I get rid? At the moment I balance precariously on the ege of the stream and PULL the strands out! Well Spritz you dont want to risk chemicals in your stream.Have you seen those weed wizards that are gas burners on extended poles. ?You briefly burn each plant to fry it and should save you reaching down. Spritzhenry, sorry I can't tell you how to get rid of it - but I do see a similarity between it and what we call Jacob's Ladder...though I believe you're right....Polemonium sounds like what I have. Thanks for responding. Hope you find answers to YOUR Jacob's Ladder. I think it might be a member of the Vetch family - that sounds familiar! Looks like I shall be balanced on the bank pulling at the wretched stuff! Can't use weedkiller as it is growing in amongst beautiful grasses etc. I've always called Jacobs Ladder on Polemonium. 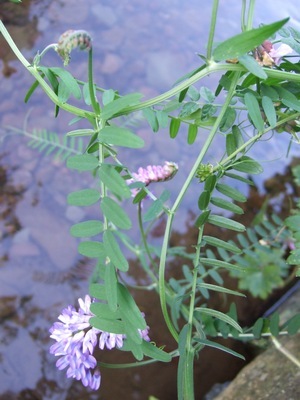 This plant you have here is a type of vetch. I've never heard it called Jacobs Ladder, but perhaps it is in Somerset. I don't know how to get rid of it though, sorry.